Paulo Coelho‘s books have been translated to more than 62 languages. An amazing success that also reflects in his Facebook marketing statistics: Almost ten million fans and a very respectable karma value of 10 points. But also a difficult situation for his fan page. With his fans scattered around the world and speaking many different languages: Which language should he choose to address his audience? This is a question many fan page owners face. They have a strong audience in their home country, e.g. Germany. The decision would be easy: post in German! But at the same time they do not want to miss the chance to go viral world-wide with a good picture or link. 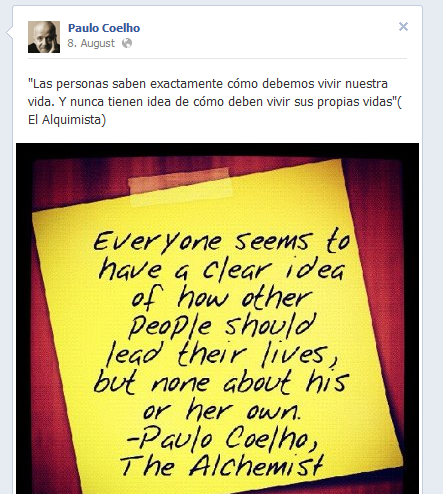 Paulo Coelho’s fan page team uses an interesting way to address this problem. A language split between content and message. And it works likes this: The content (in Coelho’s case most of the time it’s pictures with quotes from his books) is created in English. That way, people all around the world can understand and share his content. The message of the post however is made in Spanish, the language his most loyal fan base speaks. See the example in the picture.